It’s time to start thinking about seeds! Does your basement look like mine? Time to start getting your seed starting area in shape so that you are ready in just a few short weeks to start planting. Start by doing some general cleaning, removing debris, sweeping up old soil, and tossing cracked pots. I didn’t do a good job of cleaning out old pots last year when I transplanted. Haul those over to your basement sink and fill it up with hot, soapy water. I use a bottle scrubber to get the loose dirt off. Once they are clean, rinse out your sink, fill it up again, and put a few splashes of bleach. I let my pots soak a good 30 minutes. Don’t want any fungus to dampen off your new little transplants. Check your lights to see that they are in good working order. Check your heating pads to make sure they still work. Make sure you still have the extension cords, power strips, and timers available. Buy fresh potting mix. I dump all left over bags of potting mix in the garden at the end of each season. It’s not usually that much, a little in each bag. I like to start things out fresh each year. Check over your pots to see if you have all the sizes and styles you need. You can grow seeds in just about any kind of container as long as you provide drainage. I try to recycle a lot of my containers so my table is usually filled with a mish mash of colors, sizes, and shapes. It all works out in the end. Once you have everything ready to go, now the fun begins…selecting your seeds! The following information is available thanks to the Outagamie County Master Gardeners Association’s Education Committee. Check out this great upcoming conference! Gene Bush, Keynote Presenter — Shade Garden Expert. Gene has been giving talks on shade gardening for more than 15 years. Using personal experience gained from his mid-western garden and his own photography, he “speaks shade gardening,” a much-needed niche that is often neglected. He will focus on rare and unusual plants for the shade garden at this year’s event. More information at shadegardenexpert.com. Kathy Baum, Master Gardener. Kathy has a passion for perennials that is contagious. She has a vast knowledge of plants and painstakingly researches and tests many cultivars. With so many perennial cultivars hitting the market in the last few years, how do you know which are garden-worthy? Kathy will share about those she can’t live without and some that have hit the compost bin. Tammy Borden, Master Gardener. Tammy is a gardener with more than 20 years’ experience. Though her landscape is quite large, she has come to delight in miniature landscapes within her garden and home. Miniature gardens are all the rage, whether tucked into an outdoor garden space, in a fun and funky container, or as a table-top display. In her presentation she’ll demonstrate how small spaces can make a big impact. Gail Clearwater, Master Gardener will teach us how to turn trash into garden treasure. Gail’s not only a Master Gardener, but a master at turning everyday items into eye catching garden features. Back by popular demand, her presentation on turning trash into treasure features dozens of examples and how-to tips to help others create their own garden art on-the-cheap. Conference registration is $45 and includes continental breakfast, lunch, snacks and refreshments. The public is encouraged to attend. Door prizes, vendors, reference materials and information on the Master Gardener program will be available. Conference presented by the Outagamie County Master Gardeners, a non-profit community organization of the UW Extension. Registration information available at http://www.ocmga.net. Pre-registration is appreciated by March 20, 2015. The only cure for spring fever is the Plant Sale! The Outagamie County Master Gardener Association (OCMGA) is in the thick of planning for their annual plant sale. This is THEE largest fundraiser for the non profit organization and always has an amazing community turnout. The sale takes place on May 16th from 8 am to 2 pm, it is held at the Outagamie County UW Extension Office which is located at 3365 W. Brewster Street, Appleton, Wisconsin 54914. Many many hours of volunteer time, brain power and muscle go into the planning of the sale. Not only do the Master Gardeners organize the logistics of the sale, they often grow, dig, split and pot plants for the sale. One member in particular has 25 different varieties of tomatoes growing in his basement! Some of the plants are grown by Master Gardeners but many are also ordered from area greenhouses which offers a huge variety to those who come shopping for their gardens. The sale also includes a “Garden Rummage” where you can purchase second hand gardening supplies for whatever project or patio awaits you. Keep an eye on the blog for a list of the veggies, herbs, sunny and shady plants the OCMGA hopes to have at the sale. Availability is dependent upon crop availability but we’ll be able to share the wish list soon. Hopefully you can start your wish list too! If you have any questions please comment on this post and we can address it either here or through an email or phone call to you! Can you see the brainpower!? 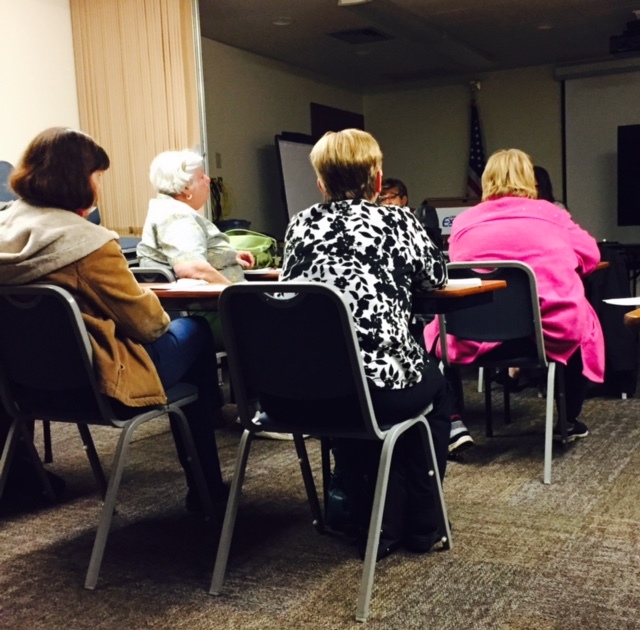 Just a few of the 16 Master Gardeners at a recent planning meeting. What do you do on a dreary night while you are waiting for the snow to fall and you have a sudden urge to garden? 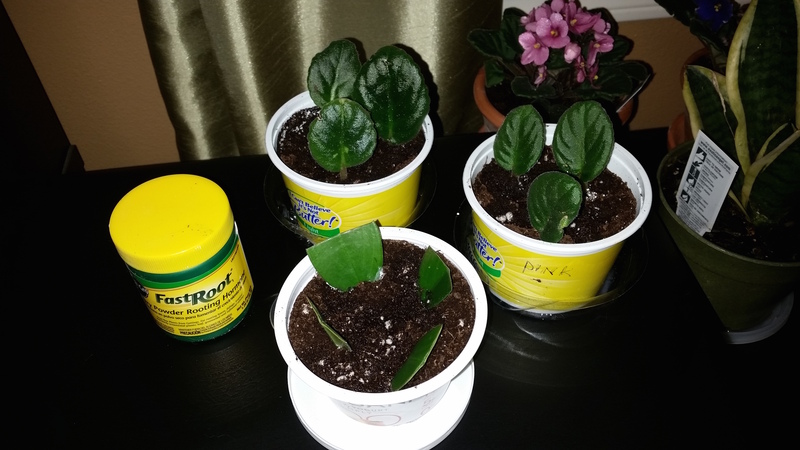 Propagate your houseplants! For those who have never tried it, it’s easier than you think. Not many supplies are needed to accomplish the task. First pick out your plant. I’m using an African Violet, but you can use many different types of houseplants for this process. You will need root starter, potting mix, small containers with holes on the bottom, room temperature water, a pie tin, and a razor blade. Start by cutting off healthy looking leaves. I’m cutting them to near the base of the plant. I’ll then use my razor blade to make a nicer cut. If you are using large leaves, you’ll need to trim those back too. They won’t look pretty but it allows the leave to focus on root growth instead of maintaining the leaf structure. Place soil in shallow containers with holes on the bottom. Use the handle of a spoon to make a small hole in the soil. Dunk the cut end of the leaf in the root starter and place in the hole in the soil. This prevents the root starter from coming off if you push it directly into the soil. Set your container in the pie tin that has room temperature water in the bottom so that the soil can draw up the water naturally. Let it soak up the water for about 10 minutes. Adjust the leaves a little to ensure that they are secure in the soil. Place somewhere out of direct light. These little leaves are in shock and need to be left alone for a while. Don’t let the soil dry out. Resist the urge to tug on a leaf to see if it is rooted yet. You’ll break off the new roots. A better indicator is if you see a new bud coming out. This could take a few weeks so be patient. It’s winter, what else is there to do but watch for a bud, right? I do this process each time I get a new African Violet. I start three new leaves and usually get at least one to grow. My odds are maybe not so great but I usually forget to water the new plants somewhere along the way so factor in some casualties. Therefore, I consider 33% a success and get a free plant out of it. Good luck with your propagation! This is a question many if not all of us have asked as we work on gardening projects. Taking our visions from planting to cultivating and harvesting can often be a baffling and humbling experience. The same question comes up as we set out to create a gardening blog. The contributors to this blog are all members of the Outagamie County Master Gardener Association in Outagamie County, Wisconsin. All of the members have a passion for gardening and have committed to learning, teaching and volunteering on gardening and horticultural topics. The group shares so many diverse interests that we hope to use this blog to capture and share them with a wider audience. Please follow as we share the many community and personal projects the Outagamie County Master Gardeners are digging at the moment!